Sono-Tek emloyees (above) dressed up to resemble the ghosts in Pac-Man, while also being prepared for the potential rain. Families and friends gathered on Sunday to show off their boats that would later set sail on the Wallkill River. The preparation for the annual New Paltz Regatta was full of excitement and eagerness. New Paltz residents of all ages were found in front of various different boats that were attached to their trucks or trailers. Although the sky was filled with clouds, the energy remained high. The 63rd New Paltz Regatta was officially underway. The New Paltz Regatta has a long history. According to the event’s site, the Regatta dates back to May 15, 1955. It all began with the Delta Kappa Fraternity of SUNY New Paltz, who built homemade boats from barrels, ropes, wires and even tractor inner tubes. The start of the race was at the “Old Swimming Hole,” and the finish line was the Rt. 299 bridge, where it remains today. Although it started in the ’50s, the event has not been held annually. Fortunately, it has been “running steadily for about 15 years now,” according to Theresa Fall, chair of the New Paltz Regatta. The event is rain or shine, with the past couple of years consisting mostly of rain. “We have a decent turn out today. We can be five times as large of a crowd,” Fall said. This year there were eight boats that participated in the Regatta with a significant crowd watching from the sides. The Harrington and Hasbrouck families were amongst those who participated in building a boat for the 2018 New Paltz Regatta. It is their 19th year participating and they have now reached three generations who have been involved with the event. This year their theme was rainbows and unicorns. “I don’t know [where I got my idea from], my crazy love of unicorns,” said Mackenzie Hasbrouck, daughter of Heidi and AJ Hasbrouck. “You see here, everything is unicorn themed.” Heidi explained how unicorns represent fun and happiness. Mackenzie enjoys the parade from Village Hall to Plains Road, where the boat launch is located, because she gets to throw candy to those watching. Amy Harrington’s father participated in the ’50s when it first began. It has become a tradition within both of their families to create a group boat. “Nineteen years ago we had a whole bunch of families, with a whole bunch of kids that were reckless and dangerous and needed something to do,” AJ said. The theme their first year was the yellow submarine. They began with about 20 people collaborating and working on it but have downsized since for various reasons. Since the Delta Kappa Fraternity created the Regatta, many people wish the students would get involved again. Fall admits that if the regatta was held in April then maybe more students would be able to participate. Fall recommends getting sponsored by a company. For example, Sono-Tek Corporation is a company based in Milton, New York who are now fourth-year participants. They received a minor budget from their company and a group of employees work to build the boat. The employees are from all over the Hudson Valley; the design was made by employee Mike Delia. 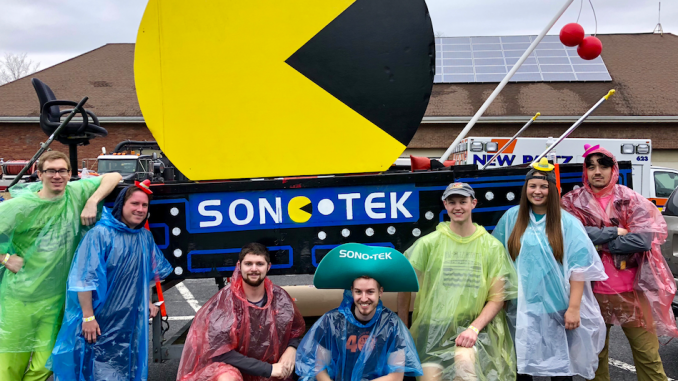 This year Sono-Tek kept their frame from last year’s boat, but decided to create a Pac-Man theme. By collaborating with the entire staff they were able to build a unique boat that was also efficient. What was named “USS Floatie Boat,” by the Sono-Tek team, won fastest in the race for the second year in a row. The New Paltz Regatta has several different prize categories, which include: best in show, most creative, most theatrical, green award, funniest and best design. This year’s sponsors included The Gilded Otter, Jar’d, SUNY New Paltz, The Parish, the Town and Village of New Paltz, Masseo Landscaping and many more. Fall noted how helpful the Town and Village of New Paltz has been as well as the New Paltz Police Department. The event is completely volunteer- run. There was also a duck race, face painting, music by Ratboy Jr and Yard Sale and more on the Gilded Otter lawn. “It is about the fun of it, not about who comes in first place,” Fall said. The registration fee for the race is only $25. It’s not too early to grab your friends and family and start thinking about a theme for your boat for the New Paltz Regatta 2019!